Videos : Tuukka Rask hurt after getting bulldozed into his own net. Tuukka Rask hurt after getting bulldozed into his own net. The Boston Bruins ans their fans are holding their collective breath tonight. In a very dangerous looking incident Bruins star goaltender Tuukka Rask has been injured and has left the game with help from his teammates. The Bruins are facing off against the New York Rangers on Saturday night and things got off to a very rocky start in the game's first period. The Bruins took an early 1 - 0 lead over the Rangers and it was looking good for them early, but when the Rangers close that gap things turned catastrophic for the Bruins. It was a tremendous effort from New York Rangers forward Filip Chytil that got the Rangers on the board but it was also that very same effort that would leave Rask in a very bad way. 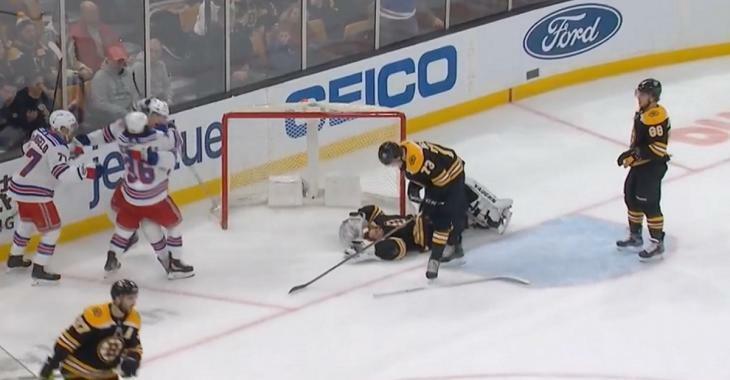 Chytil made a charge for the Bruins net as he tried to find the back of the net, and although his attempt at scoring was successful, just prior to getting the puck off of his stick he was bumped ever so slightly by Bruins defenseman Charlie McAvoy. That bump was enough to alter Chytil's trajectory, which looked at the time as if he was attempting to avoid contact with Rask, and it instead pointed him directly in the direction of the Bruins goaltender. That is exactly where all the force of Chytil's momentum would go in the end, directly into the unsuspecting body of Tuukka Rask, slamming Rask back into his own goal post and potentially even the crossbar as well. The net would come completely dislodged which is of course a good sign for Raks and the Bruins, the net is designed to come off it's moorings to reduce the impact on the player colliding with it, but in spite of that Rask would stay down on the ice for several long moments. The Bruins star would lay there not moving for a long time before eventually showing some signs of life again but it was clear that the veteran was not in a good way. Rask had a very hard time getting back to his feet and needed the help of his fellow Bruins to get off the ice as well, scary stuff if you're a bruins fan. Sean Avery unloads on Jake DeBrusk and calls out Auston Matthews after Game 2. Breaking: NHL Player Safety releases full details of Nazem Kadri's hearing. Breaking: The KHL's points leader has just signed with an NHL playoff team. Ovechkin drops the gloves and KOs Svechnikov! Reaves and Kane drop the gloves in the final minutes of Game 3!